Gabriel DropOut reaches its end (hopefully just for now) with these two specials that as a fan of the series left me very satisfied. I won't go over the characters since I already have the review of the TV version for that, so I will comment what you will find in these two specials. The first one is the obligatory onsen/hot springs episode, with more fanservice than the one from the main series... at least as much as the divine protection allows it. Fun episode with the typical character interactions but in that setting. The second one caught me completely by surprise since it went for a way more dramatic route, with our girls interacting with a girl who has severe sight problems. I didn't expect it at all and I admit that it hit me right in the feels, while this anime is clearly comedy focused, it also knows how to do drama. Overall these two specials kept the level of the main series and even did some parts better, if you liked Gabriel DropOut, these specials are a must watch. The following review is completely spoiler-free, and is meant for users who are curious about whether to watch the show or not. While I write reviews with this focus, and the goal of presenting the show with little bias, it is impossible to write a completely unbiased review. Feel free to disagree with any of my opinions, and ultimately decide for yourself how you feel about the show after watching it yourself! The first special, while certainly different in a few ways from a regular episode, carries over much of the comedy and character interaction from the original series. 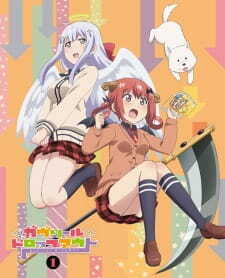 Gabriel Dropout was a show that excelled in its characters and the repetition of their interactions so if you enjoyed the series, you'll find a welcome return to form here. The second special was a completely different tone to the entire series and special #1, and as such is an incredibly unique Gabriel Dropout experience. While the episode's goal shifts entirely from comedy to drama, it does so surprisingly gracefully and powerfully. I found myself incredibly impressed that a show so resoundingly light and goofy could pull off a very serious episode so well. The first special is very much the fanservice episode. It does so comedically, so do not fret about it being tasteless or out of place, however it is certainly doesn't shy away from sexual comedy or innuendos. I personally enjoy sexual humour and do not mind the occasional strange line-walking that characterizes a fanservice episode in an otherwise non-fanservice show. However, I understand and cannot blame those who do not enjoy these things, and for those people, this special can be a bit uncomfortable among its ridiculousness. As mentioned above, special #2 is very different to a regular Gabriel Dropout episode. And while I believe it to be well done, I can understand why some would look at this as being completely off-brand for a light comedic CGDCT anime, and end up not enjoying it. Clearly if you're reading a review about Gabriel Dropout Specials, you've already watched or are interested in the original show. These two specials provide two very unique and special episodes (living up to the title of "special"), for separate reasons. They're definitely a lot more hit-and-miss than the original series, and explore more unstable grounds, but their bold decision to break the formula and try something new should be commended. Specials are a great place to stretch an otherwise consistent series to its limits and test new grounds, which is exactly what Doga Koba did with these two Gabriel Dropout short stories. While it makes for nice averages and wonderful sorting, when it comes to reviews I personally do not like direct numbering systems. Instead, I am to answer the question: "Would you recommend I watch this show?". If you are uncomfortable with the idea of fanservice/light sexualization of the characters of the show, even for strictly comedic purposes, I would recommend potentially skipping the first special. If you are uncomfortable with the idea of the show's characters being put in a dramatic/serious situation, or simply wish to only watch episodes that will make you happy (I don't blame you), I would recommend potentially skipping the second special. Otherwise, I would highly recommend watching these specials for their intriguing uniqueness.